Show off your singing talent by singing “Jealous” with Nick Jonas! 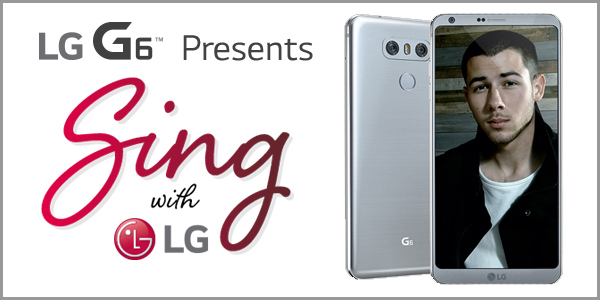 You could win the grand prize: a new LG G6 smartphone, an LG Home Entertainment System, and a chance to meet Nick in person. There are also various prizes for the first, second and third place runners-up like an LG TONE, LG Music Flow speakers, and other awesome products. Everyone who submits a video will be entered to win other great prizes like an LG G6, LG Music Flow, and more. Every participant who shares their rendition of “Jealous” on YouTube will be entered to win one of 20 LG TONE Studio headsets. After your submission, fill out the Sing with LG survey. Ten people who complete it will win an LG TONE Premium. Official Rules: Open to US, DC, 13 and older. Begins on April 19, 2017 and ends May 12, 2017 at 11:59:59 PM ET. YouTube, Participation and Survey Random Drawings on or about May 17, 2017. Entry Limit: One Contest Entry, one YouTube Upload Sweepstakes, one Participation Sweepstakes Entry, and one Survey Sweepstakes Entry per person. How to Enter Contest: During the Promotion Period, use the Sing! Karaoke by Smule App to record a duet performance to “Jealous” by NickJonas. You may only record a video to “Jealous”. No other song recordings will be accepted. NOTE: To participate in the YouTube Upload Sweepstakes, participant must follow the YouTube Upload Sweepstakes Entry instructions below prior to submitting his/her Contest Entry. Click on the link to the LG page located within Smule; Complete the entry form in its entirety, including a link to your Smule Video, and submit. YouTube Upload Sweepstakes Entry: entrant must post his/her YouTube account, and provide the YouTube share URL to the Video along with his/her Contest Entry to receive one entry into the YouTube Upload Sweepstakes. Participation Entry: Upon successfully submitting a Contest Entry, entrant will automatically receive one entry into the Sweepstakes. Survey Entry: Upon successfully submitting a Contest Entry, entrant will have the option to take a short survey with regards to his/her entry submission process. Entrant must complete the survey in its entirety and submit as instructed to receive one entry into the Survey Sweepstakes.